If you have questions about a program or need advice about course selection, speaking with an advisor in the college you plan to enter, or in a college you plan to apply to in the future, is the best way to make sure your educational plans will be on track. If you're taking uSask classes at an off-campus site, there will be a local advisor available to you in addition to the college advisors above. Want to learn more about uSask colleges and programs? Download our viewbooks and college brochures. Provides an overview of the University of Saskatchewan campus, the city of Saskatoon, student supports, housing options, scholarships, tuition, admission requirements, application deadlines, program info, how to apply and more. 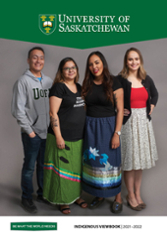 Shares stories from Indigenous students, alumni, faculty and staff, and provides information about Indigenous community and opportunities at uSask. Provides information on undergraduate and graduate programs, admission and language proficiency requirements, how to apply, tuition fees, scholarships, international student support, health and study permit information and more. The international viewbook is also available in Spanish, Chinese and Vietnamese. Provides IB students with information on advanced credit, programs, admission requirements, scholarships and more.